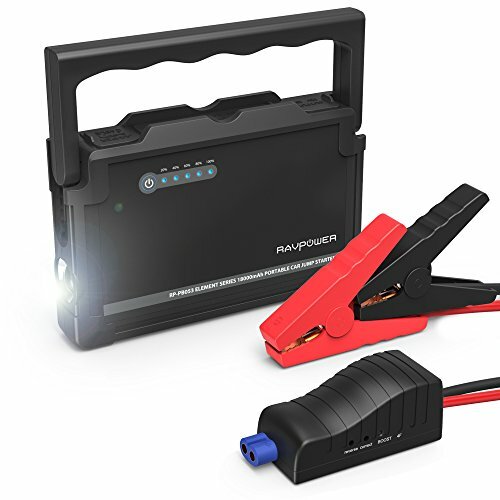 With a high 12V/10A car cigarette lighter output, the jump starter powers your car accessories and appliances of up to 120W power to provide extra convenience and sustainability for your life on the road. Jump starts your car of 6L gasoline / 3L diesel engine in a blink of an eye thanks to its outstanding 600A peak current. The 18000mAh capacity lasts through 20 times of jump starting so that you'll never caught off guard. This versatile car jump starter takes care of all your devices with dual iSmart USB ports. Charge your smartphones, tablets, car DVR, and GPS system on the road and never run out of power again. Crafted with multiple safety protections against short circuit, reverse connection, high temperature, and surge voltage, the smart plug gives a smooth boost to your car every time. The advanced LiFePO4 battery lasts through over 2000 recharges with better conductivity and less heating. Benefit from a handy flashlight that has normal, warning, and SOS mode to help you send signals and get rescued when caught in the darkness. Up to 72 hours of work time is sure guide you to safety. The retractable handle adds convenience for when you just need to pick it up and go. Over 20 Boosts on 1 Charge: 600A peak current jump starts diesel engines (up to 3L) and gasoline engines (up to 6L) over 20 times on 1 charge; 15V/1A DC input provides a full recharge in 5 hours. Phone and Tablet Charging: Experience fast and simultaneous charging for smartphones and tablets with dual iSmart USB ports (5V/1.5A and 5V/2.1A); 18000mAh battery charges iPhone 7 up to 6.5x, Galaxy S7 up to 4x, iPad Mini up to 2x. 3 day Survival Flashlight with Retractable Handle: Enjoy up to 72 hours of emergency illumination with 3 modes (ON, Warning, and SOS) to help you see and be seen in the dark. A retractable handle comes handy for when you just need to grab and go.